As I’m typing this, I have literally just finished reading J Man’s review of the PlayStation version of TWINE, and am finally getting off my duff long enough to finish the N64 review, and much like J Man’s decision to not play the N64 version, I did not play the PSX version, so any comparisons to that iteration are based off of his impressions and recollections and not my own personal experience. 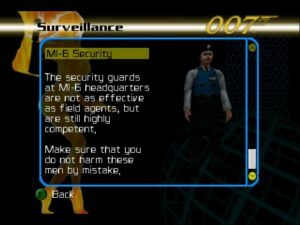 Also, unlike the PSX version, which was somewhat assisted by low expectations (the only Bond game before this was Tomorrow Never Dies, which was…not great), developer Eurocom had to compete with the legendary Goldeneye, so anything less than a home run was bound to be considered a disappointment. Sadly, they couldn’t quite replicate that success, but what they did give us is a very solid effort on its own. Attention to Detail: The elevators in the bank actually work. Quite obviously, the story remains the same here. An MI6 agent investigating terrorist attacks on an oil pipeline is killed, the money trail leads to a Swiss banker in Spain, and sure enough, the only lead gets snuffed out, and 007 has to set off to foil yet another nefarious and completely overengineered plot and save the world. 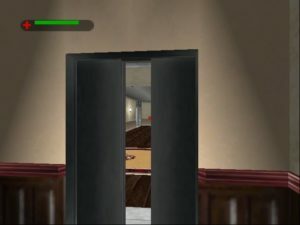 Alas, this being an N64 game, there are no actual scenes from the movie here, instead, all cutscenes are handled in-engine, the limitations of which require a few shortcuts to be taken (in the movie, the banker is killed by a sniper after Bond notices the laser sight on him, in the game, Cigar Girl just pulls a gun out and shoots him). N64 TWINE stretches across 14 levels, although one is basically broken into two halves. The levels generally stick to the plot, although one or two were leaps of faith (I don’t remember Bond having to trudge through a tube station in the movie). Most of them are your basic action stages, but there’s also a rail-shooter stage where you’re allegedly on skis, and there’s a mission where stealth is enforced and you’re not allowed to use lethal force. Needless to say, it’s the least fun mission in the game. I’m happy to also report that there’s no casino level to bog down the action and test your patience, it’s FPS all the way here, although the last level, where you have to navigate through a disabled and flooded submarine through trial and error for the first 90% of it, isn’t exactly a highlight. 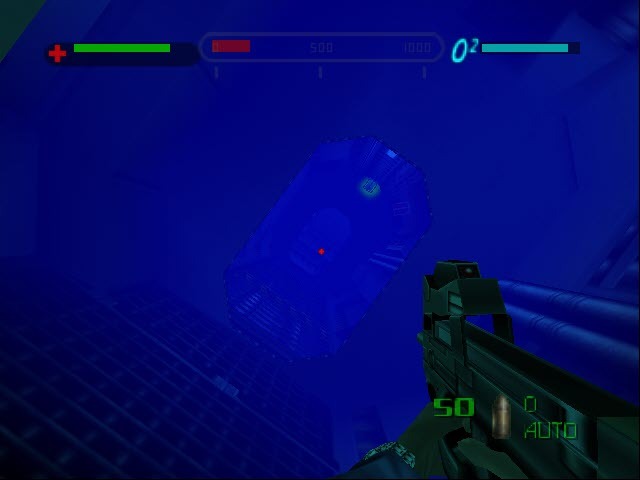 Unlike the PSX version, different difficulty levels do increase the number of objectives and the number of tasks that comprise an objective. For example, the aforementioned stealth level requires you to bug a certain number of telephones. On Agent, it’s just two. On 00 Agent, it becomes four, and one phone is moved to a different location. Also, as you increase the difficulty, your auto-aim loses effectiveness; on 00 Agent, you’ll have to aim yourself. 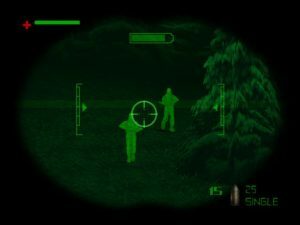 Stalking targets with night vision. One aspect that needs to be pointed out is that this game is far less forgiving than Goldeneye. Seemingly every other level features a hostage situation that requires pinpoint timing and accuracy or civilians in one form or another milling about, and one hostage lost or one civilian winged by a stray bullet as they stumble into a firefight means an instant mission failure. Not only that, but unlike Goldeneye, where enemies dropped a specific amount of ammo depending on the difficulty level, here it is entirely random, and worse yet, you never pick up all that much. I understand it was a “sake-of-realism” type of choice, but I can’t stress how frequently I would be down to my last magazine, take a third of that to kill an enemy, and then be rewarded with TWO BULLETS. Not to mention the fact that there’s quite a bit of jumping to be done in this game, and while I don’t believe the strafe-run jump technique is required for any of them, per se, it’s a skill you’d be well-advised to master in a hurry. Aside from the inclusion of jumping, most everything handles quite similarly to Goldeneye: Z fires, B reloads, A switches weapons and so forth, but there are a couple cool new wrinkles thrown in.For one, if you can manage to sneak up behind an enemy and poke him in the back, he’ll surrender and drop his weapon (although if you turn your back on him, he’ll reach for a backup pistol). Holding A and pressing B cycles through your gadgets, with the reverse toggling X-Ray or night vision, if you have either. Your watch features four different powers: a close-range taser, a non-lethal dart gun for silent takedowns at range, a laser that can cut locks or deactivate alarm panels, and a grapple that sticks to black and yellow striped panels, giving it the versatility you’d like to see in a Bond gadget. Sadly, the watch is the exception, as most of the others fall into the GoldenEye mentality of being used for one and only one purpose. Well, when you think about it, the James Bond character’s about that age. Any FPS is only as good as its arsenal, and TWINE brings a pretty solid selection to the table. Your default pistol (called the Wolfram P2K in the N64 version) is a little weak, but capable of dealing with cookie-cutter enemies fairly reliably. There are a couple of magnum pistols, a nice smattering of assault rifles with high stopping power, a pair of sniper rifles, a handful of submachine guns that are fine, but REALLY handicapped by ammo shortages, a guided missile launcher that’s the size of a breadbox and will home in on wherever the laser sight is pointed, and a number of bizarre weapons like a crossbow that requires you to account for bullet drop when you target at long range, and a double-barreled speargun carried by scuba divers. Most every weapon has an alternate fire mode that can be switched to by holding B and pressing Z; your pistol can switch between regular and silenced modes, rifles can toggle full auto or burst modes, and the grenade launcher can switch between impact detonation and a time-delayed detonation. The shotgun seems to be a little more capable on the N64 version than on PSX, but the biggest downside to using it is the fact that every shell must be reloaded one at a time (the same also applies to the bolt-action sniper rifle), which basically ruins its value after you empty the first magazine. And yes, there’s an RCP-90 knockoff to be found here as well. Perhaps the biggest advantage the N64 version has over its PlayStation counterpart, though, is the inclusion of multiplayer. Up to 4 players can throw down on a variety of maps and game modes, with the option to have CPU bots filling in any empty slots. You can unlock new skins, game modes, maps, and weapon sets by beating single player stages on certain difficulties by a certain time, much like Goldeneye. 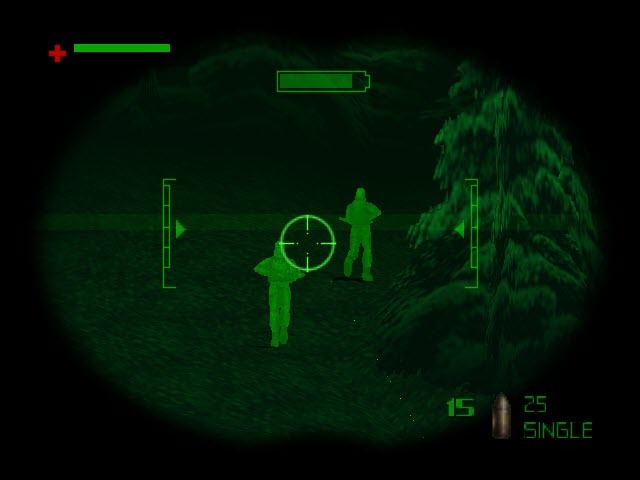 AI bots have different stats, both in terms of health and personality, for example, Bond starts with 150 health, and is a Team Player, meaning he’ll be more focused on achieving the goal of the game (like capturing the flag or the satellite feeds in Uplink), but Renard is an Assassin, which means he concentrates more on killing other players than anything else. Also, a couple skins (Valentin Zukovsky and Bathing Woman) literally cannot run, instead, they just kinda waddle about and make easy targets. Skins are also categorized as Good or Evil, and sadly, Good skins are not allowed to team with Evil skins, nor are they allowed to fight other Good skins, so if you’re playing a 4-player free-for-all and one of you picks Bond, the rest of you have to pick baddies. Again, it’s another example of “sake-of-realism” overcoming practicality. Translation: You’re going to accidentally shoot this guy. Some of the multiplayer options are going to see more run than others. 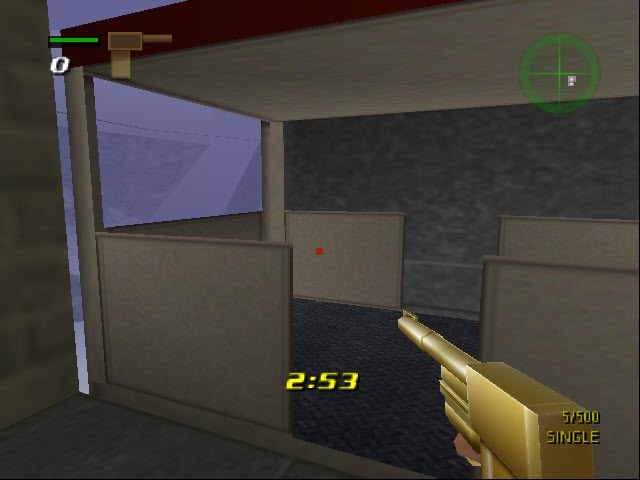 Two of the maps, Sky Rail, which features a gondola that runs between two stations and serves as a mobile sniper point, and Air Raid, which has you battling between a spy plane and a refueling jet, are actually quite fun and innovative, and the revamped Golden Gun mode (where you have to put together the three pieces of the Golden Gun and then tag the other players with it to win) can be good frantic fun. The only real complaint I had about multiplayer was that you really can’t select your weapons, instead, you’re stuck picking from different preset groups, and the game seems to have overvalued the more exotic (RE: less practical) weapons. Visually, TWINE’s strong for a late N64 game, and closer resembles Perfect Dark instead of Goldeneye. Reloading now shows you removing a clip and physically placing a new one in your gun, which is a nice touch, but a bit of a double-edged sword when you’re using a slow-reloading weapon like the Mustang .44 or the aforementioned shotgun. 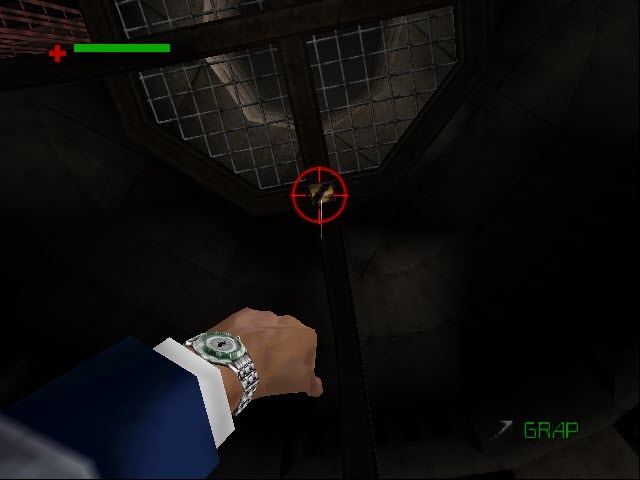 Important objects in the missions flash a la Resident Evil, and enemies don’t lock in place to fire like Goldeneye, instead, they’re actually capable (and at times, frustratingly efficient) at sidestepping and ducking behind cover in a firefight. As I said, cutscenes are handled in-engine, and while characters look more detailed than Goldeneye, they still have a very “action figure” look when they’re speaking and their faces remain frozen. 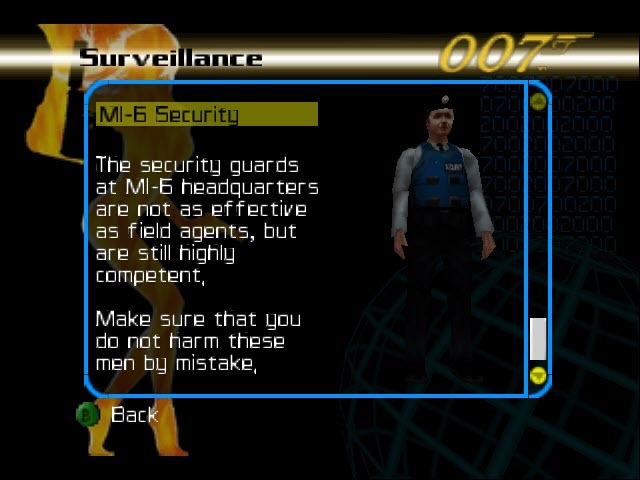 Voice samples are passable for who they’re supposed to be; much like the PSX version, Bond sounds pretty close to Pierce Brosnan, and even the bit players in the story sound alright, especially Valentin. Elektra’s voice isn’t terrible, but you can get the impression the voice actor playing her was stuck between trying to emulate Sophie Marceau’s French accent and a British accent her character is kinda supposed to have. There’s also a lot more gesticulation here than Goldeneye; civilians will put their hands up and beg off convincingly as opposed to Goldeneye’s “hands up, back bent, knees shaking like I really gotta piss” civilians, and even run-of-the-mill enemies will announce your presence, although that does mean you’ll end up hearing “Bond is HERE!” way more times than you’d care to. In the end, The World Is Not Enough is a pretty solid game that acquits itself nicely considering the competition it was up against in many gamers’ minds. The multiplayer mode definitely gives it some separation from the PSX version, and while it doesn’t have the obvious advantages a CD game is going to inherently have, the designers did a really admirable job of working within the limitations they had where they had to. It might feel a bit on the short side, but it’s enough of a challenge, especially on the higher difficulty levels, to make beating it feel like an accomplishment. Although it’s not quite as heralded as Big Brother Goldeneye or Distant Cousin Perfect Dark, TWINE definitely is a quality game that deserved a bit more attention than it got, and is definitely worthy of a play for Bond fans or FPS aficionados. An FPS with no glaring holes, multiplayer and the higher difficulties provide replay value, about as well-acted as you could hope from a cartridge game, NO BLACKJACK LEVEL HERE. I’m going to level with you, it’s nowhere near as groundbreaking or seminal as Goldeneye or as refined as Perfect Dark, a bit on the short side, and you’re just not going to use some of the multiplayer options. They actually flooded the submarine in this version – I was wondering about that. Dry as can be in the PSX, with a section where you have to run through the reactor while watching your “rads taken” gadget. No jumping either. I like the AI bot personalities. I can see where that would have been useful back in the day. Yeah, the sub was flooded and the “reactor temp meter” at the top of the screen served as your time limit (it went up quicker on higher difficulties). I’m still amazed the PSX version doesn’t even have some cheap, tacked-on multiplayer feature…you’d think by 2000, that’d be mandatory.